Some scientists say that face recognition occurs in a particular section of the brain. 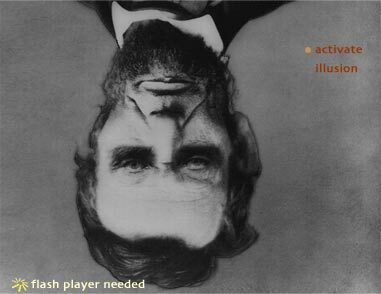 To the brain, this image of Lincoln's face looks normal when viewed upside down, but when turned around becomes clearly distorted. This is because our brains recognize a face only when it is right side up. When it is presented upside down, the brain no longer recognizes it as a face but rather as an object, which is why we do not respond to its distortions.